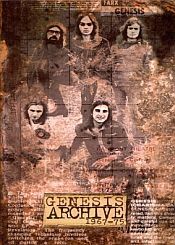 I appear to be in the minority at Prog Archives concerning this first box set of archival recordings released by Genesis. I don't consider this a masterpiece and I don't recommend it to first-time listeners of the group. I do not consider The Lamb Lies Down on Broadway a masterpiece. I think it could've been a much better record if it was only limited to one LP instead of two. Half this box set is taken up by the performance of it live. It really is a nicely done performance, but like I said on my other review, it drags on for too long. My favorite CD of the collection is the third one because it has some unreleased material and contains some live performances by Gabriel of material that was never made available before. The fourth CD is just a bunch of demos mostly from 1968, some of which would make it onto their debut album. Their debut album was just awful, so the demos and recordings of things that didn't make the cut are even worst. I understand this is archival stuff, thus aptly titled "Archive," so this box set to me serves more of a historical purpose for die-hard fans of the group. Thus I can't recommend this for everyone. Newcomers to the group should start with their studio albums of 1970-1980 (maybe later years if you dare). After that, if you really love Genesis, then consider getting their Archive box sets. At the very least, they are nicely done supplements to a Genesis collection. I would have to give this work three stars, mostly for the material on the third disc and for some of the better material scattered about on the first two discs containing The Lamb live.